According to Lenovo, there will be no new additions to the ultra high-end Legion Y900 series as priorities have shifted to the mainstream gaming segment instead. The more affordable Legion Y530, Y730, and Y7000 will all be launching in the July to September time frame. There is potential in a proper Y920 successor further down the line when the new Nvidia GPUs become available. 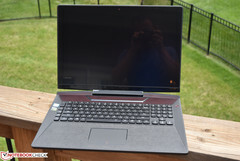 Not to be outdone in the growing gaming space, Lenovo will be live at E3 this week to showcase its upcoming 15.6-inch Legion Y530, 15.6-inch Legion Y730-15, 17.3-inch Legion Y730-17, and 15.6-inch Legion Y7000 alongside competing alternatives from the Dell Alienware and Gigabyte Aorus brands. Curiously missing, however, is the “Legion Y930” to succeed last year’s Legion Y920. Whereas the Legion Y500 and Y700 families cater to entry-level and high-end gaming markets, respectively, the Legion Y900 family is Lenovo’s super enthusiast segment akin to the bulky HP Omen X 17, Asus ROG G703, or Aorus X9. E3 would have been as good of a time as any to show off enthusiast gaming products, but Lenovo has told us that its Y900 family will be taking a backseat for now in order to refocus on the more lucrative mainstream Y500 and Y700 segments. As refreshing as the new Legion designs may be, it is still missing a flagship model with Core i9 options. It’s possible that Lenovo is seeing no value in a Core i9 proposition and our own tests with existing Core i9 laptops have indeed been showing minuscule performance margins when compared to a less expensive Core i7-8750H offering. Nonetheless, there is a chance that the manufacturer is simply waiting for the next generation of Nvidia GPUs before fully reintroducing the Y900 series. The Legion Y920 was notable for including a built-in mechanical keyboard and a “Turbo” performance switch. At almost $3000 USD, however, users may have found little reason to prefer it over more mature and “established” gaming brands like an Asus ROG or Alienware 17 alternative.